Very little information about this HX-52 which was probably an extended version of the HX-51, but we don't know the technical differences between the two versions. 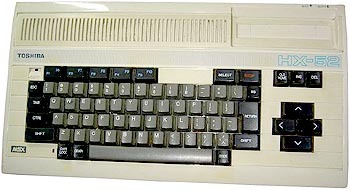 It was a standard MSX 1 machine which held a particular IC, also designed by Toshiba, and called T7937. Inside this unique chip one found a Z80 compatible CPU, a TMS-9918A Video Display Processor, and an AY-3-8910A sound generator. The HX-52 also offered three video outputs - RGB scart socket, TV aerial and composite video jacks. Obviously, this computer was sold in very small quantities. Thanks to E.Calogiuri for the pictures. see more Toshiba HX-52 Ebay auctions !